Owning a house can be a lot of work, we all know there is a lot of maintenance but it’s incredibly satisfying when you keep it up and have built a home for your family. With regular attention, the worry of having to tackle huge cleaning jobs in the future goes right out the window. Homeowners often focus on keeping their tile clean but underestimate just how important keeping up on grout cleaning is. 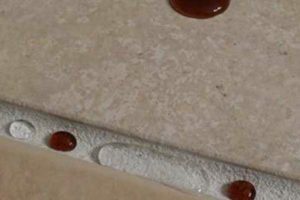 Want to learn why your grout is just as important as any other aspect of your waterproof surfaces? 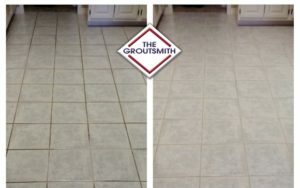 Why Is Grout Cleaning Neglected? With regular upkeep and attention, tiled floors can last decades or even longer. Many people believe that cleaning grout is too difficult, but if the problem is tackled regularly there isn’t the tough build-up that discourages most people. What Do I Clean My Grout With? Grout is a special mixture of water, cement, sand and coloring agents designed to waterproof the gaps between your tile. Because of this it’s important to never clean your grout with any harsh chemicals or abrasives. For everyday cleaning, a simple 1/4 cup of white vinegar, mixed with 1 gallon of water works well (remember acids can damage your tile). 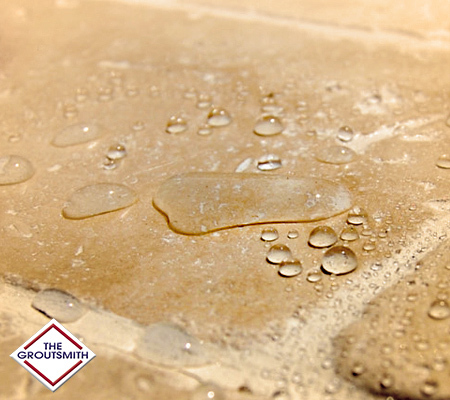 Or you can use Groutsmith’s proprietary cleaners designed specifically for your sealed grout. If it’s been a while since you did this kind of cleaning, it may be best to call in a professional for the initial restoration and then it’s back in your hands. Grout sealer is the specialized product we apply to the surface to protect your grout and make this porous material water resistant. Once sealed the grout will no longer absorb the dirt and grime in water that usually seeps in and causes discoloration and bacteria growth, which makes for a harder time cleaning. Colored sealer can even add a design element to your tiled surfaces. A properly applied sealer makes grout and tile cleaning much easier down the road since your porous grout is what attracts most of the dirt and grime. Grout cleaning is important in the maintenance of a home because when left to fester, bacteria and germs can build up and cause that musty smell we all hate. Not only is this unsightly and stinky for you and your guests, but it can also pose a health risk to your family and pets. Protect your home by making sure that buildup doesn’t happen. Want to get a jump on the project? Just give Groutsmith Boise a call and we can clean and seal all of your tiled surfaces. After that it’s up to you.